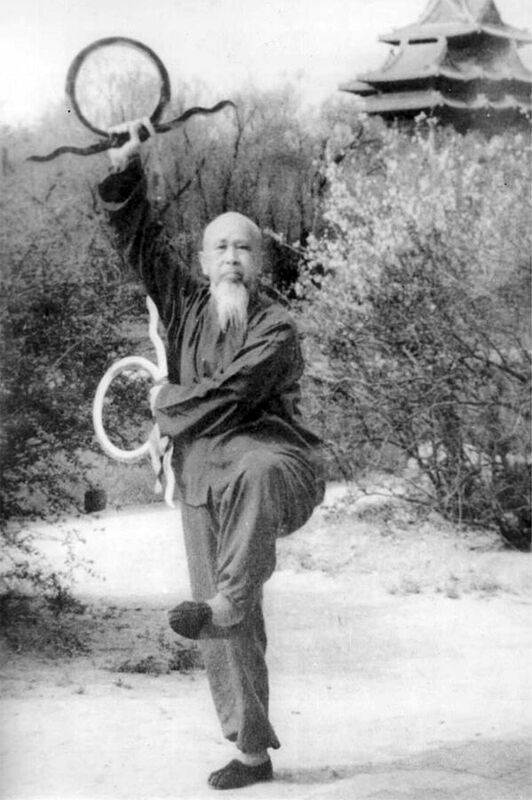 When Ba Gua practitioners like Gao Yi Sheng moved from the countryside to the city, they adapted the actions the walking stick movements to the city version of a walking stick, the cane. The cane is often constructed from a flexible but sturdy wood like rattan. The Ba Gua Cane, like the Seven Star Stick, blends actions of the Staff, Spear, Sword and Saber together in rapid fire sequences that exemplify the art of constant change. However the crooked end of the cane adds another dimension: hooking, locking and throwing the opponent. The crook can be used to devastating effect when hooking limbs and even the neck. Because a wooden cane can be carried anywhere it is very practical for self-defense. The spear is considered by many to be one of the most difficult weapons in the Chinese martial arts. This is partially because when using the spear, energy and intention must be extended outward to the tip of the spear as it rotates, cuts and pierces with precision and refined power. The Chinese spear is long (6.5 to 7.5 feet) and has a tapered and flexible shaft with a crest of red horsehair behind the tip. The horse hair both distracts the opponent, and in training, its movement provides feedback relating to correct rotation and power delivery. Another difficult, yet valuable educational aspect of the spear, is that very small movements in the hands and body produce much larger movements at the tip of the weapon. The spear therefore refines one’s internal control of exterior movement to a high level. 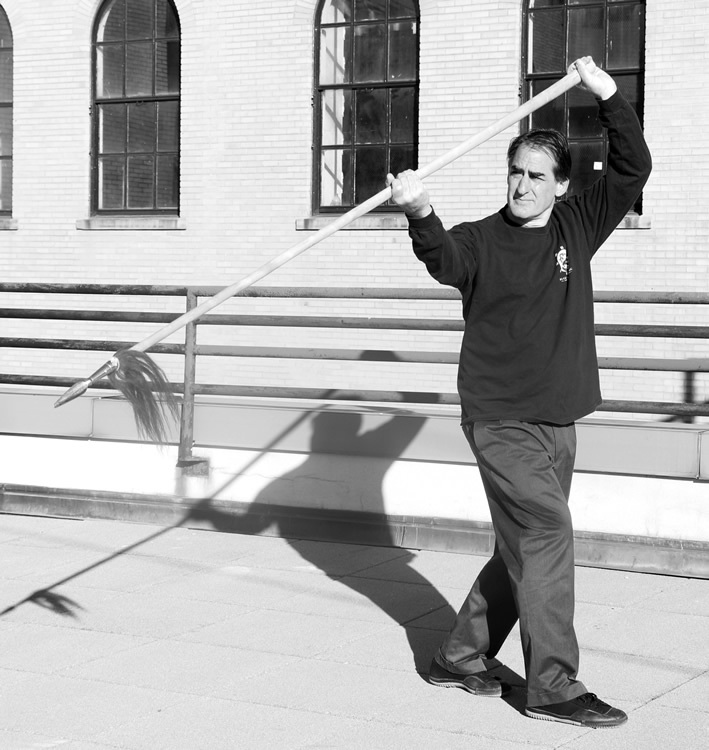 The flexible shaft of the spear helps to develop a refined elastic, shaking power in the empty hand forms. At the same time, this elastic power is part of the technique of using the spear to deflect and attack. 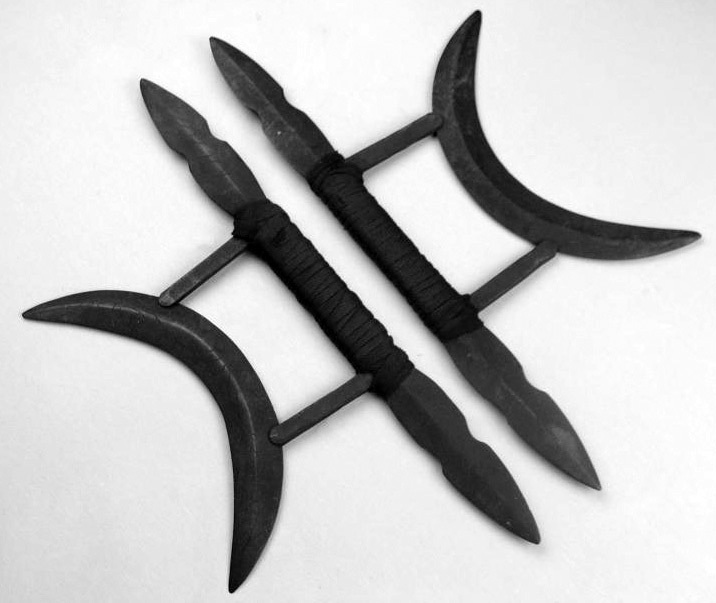 There are many multi-edged, hooked knife-like weapons that are used in pairs in Ba Gua Zhang. This is partly because the footwork of Ba Gua lends itself to knife-like weapons, but also because there is disagreement about the nature of the Founder’s (Dong Hai Chuan), personal weapon. 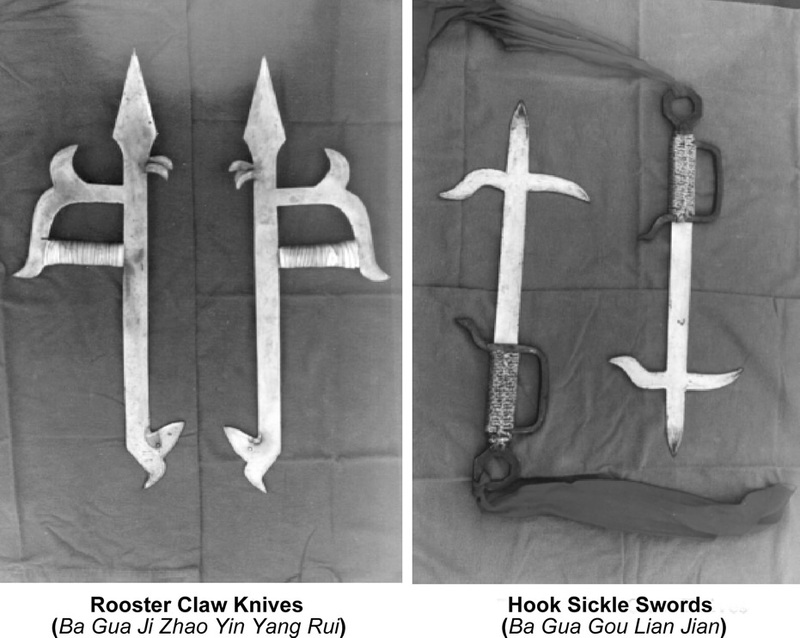 Some say it looked like the Rooster Claw Knives pictured below, others argue that it resembled the Mandarin Duck Knives (which themselves have many variations and names). The Rooster Claw Knife is a unique weapon that lays along the forearm, but can suddenly be extended outward to increase its length when chopping and hooking. Parts of the weapon resemble the tail and head of the rooster and it also has a distinctive claw from which it derives it name. As a training tool, its weight and configuration make it a challenging weapon that develops strength in the shoulder girdle and arm, while teaching to hook, chop, thrust and punch with power and control. One must extend the weapon out from the body and let its weight pull the steps and waist. In a sense, the steps the steps and waist simultaneously guide and drive the weapon and are themselves also pulled and activated by the weapon. These weapons resemble a kind of tomahawk more than a sword. In usage they resemble the Rooster Claw Knives, and in fact many of the movements for these two weapons are essentially the same. The difference is in the Shen Fa and power dynamic. The Rooster Claw Knives focus their action on the back, and the shoulder girdle, with power and Jin manifesting in the upper arm and elbow. 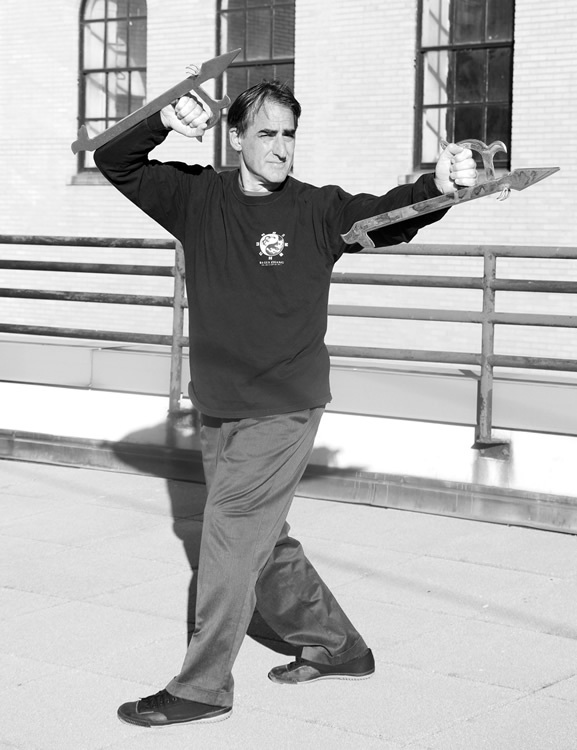 The Hook Sickle Swords focus more on the shoulder, elbow and wrist with power manifesting in the forearm and wrist. Yuan Yang Pu Can also be translated as “Mandarin Duck Axes.” In different styles of Ba Gua Zhang this weapon has different names (Deer Horn Knives, Sun Moon Knives, etc.) and variations in design and therefore usage. The Mandarin Duck Knives pierce, chop, hook, lift up, press down, deflect, and cut. The crescent moon part of the weapon can be used to trap and deflect, and the tips of the “moon” can also rake and pierce. In training the weapon develops subtle body changes in conjunction with deft elbow and wrist movements. The Wind-Wheel swords are a unique weapon that moves in unexpected circles and arcs, while deflecting, looping, hooking, piercing, and slicing. This weapon was a favorite of Li Zi Ming and Wang Shi Tong. Wang Shi Tong taught me the Wind Wheel Sword form and gave me his pair of Wind Wheel Swords. He told me that historically, this weapon had never been used in actual combat, but that it was very useful for training Shen Fa. The Rooster Claw Knives are sometimes referred to as Elbow Knives, because they lay along the forearm. However, in this style, Elbow Knives refer to a pair of long knifes, like the American Bowie knife that have a slightly a curved blade, and may also have a clipped point on the false edge. There are no specific forms with these weapons. 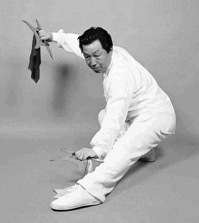 Students learn to interpret Ba Gua’s empty-hand forms, particularly forms that focus on the use of the elbow, like the Thirteen Elbows, and translate them to this weapon. This is a modern adaptation of a Xing Yi and Ba Gua weapons called respectively the “iron finger” and “judge’s pen.” These metal weapons had either points or barbs and could be concealed in the hand or in the sleeve. As a self-defense weapon they were used to surprise the opponent and amplify one’s force in striking vital points, increase leverage when locking joints and aid in blocking and deflecting. The modern version is made of wood, tapers at one end, has a knob on the other end and a leather or cloth loop that one slips over the middle finger so that the hand can open without dropping the weapon. It is hidden when the hand is open. This weapon is useful for chopping, piercing, locking. The Point Striking Stick is particularly useful as a force equalizer in self-defense situations.